Packed with Ninja Battle Boost technology, including a spring loaded cannon and a side door that automatically opens with the touch of a button, sending your favourite hero in a half shell flying out with 360 degree Ninja flip-kicking action. This is the perfect vehicle for when the Turtles hit the road together. Figures not included. 360 degree Ninja flip kicking action. Battle hatch on the top of the vehicle opens. 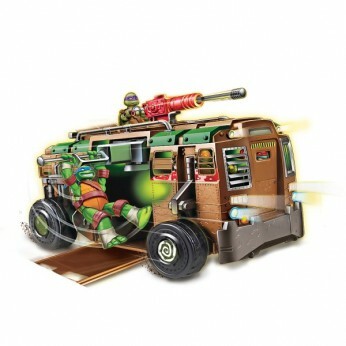 This toy costs approximately £29.99 (for the latest and best prices make sure you check our retailer list for the Turtles Shell Raiser Vehicle above). In our review of Turtles Shell Raiser Vehicle we classed it as being suitable for ages 3 years, 4 years, 5 years but recommend you check the manufacturer specific advice before purchasing.